Style format variable can be used more then once in the log. The custom style is always applied till another one is used. Let's see a bit more practical example of styled logging. In this case we'll implement a simple new method that can be used to log images. 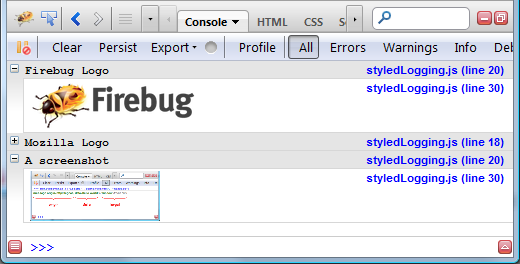 I want to use firebug style logging in my website which is supportive to IE only. So it will be fruitful to use or I have to navigate to other browser?